It stayed with me and for many years my philosophy in life has been to do 1 thing each year that terrifies me. I intentionally push my edges of existence every year in order to grow myself. I do not like the idea of being afraid or intimidated by something or someone. Yoga and meditation is a martial art. At the core of these practices lies knowing your Truth and living with integrity. This includes knowing your fears and cultivating the confidence to face them. In a safe and reasonably controlled environment it is possible to push your personal edges of comfort allowing yourself to TRAIN YOUR MIND, increase your resilience and have a very good idea of how you would respond (as opposed to react) if you ever found yourself in a situation beyond your control. The natural stress response of the body is fight, flight, freeze or fawn. It is the natural defense mechanism of humanity which is intended to keep us safe. In today’s high stress world people are very often living in the stress response loop on a daily basis without any awareness, when their life is not at threat at all. They are simply driven to behave this way due to the stress hormone, cortisol, and the behavior very easily becomes a normalised habit. Understanding this and knowing how you personally respond to intense situations allows you to utilise the practices of yoga and meditation in a practical and functional way to stay present, having full awareness and clarity of the situation and not react in the usual pattern. The only way to train resilience and to train the mind is to take yourself out of your comfort zone (in a safe way). One of my fears has been guns. They scare me because they have the capacity to control people by fear. A few years ago while driving on a 3 lane highway in South Africa, I stopped at the traffic lights. My mother was in the car with me and my handbag was behind the drivers seat with every thing of importance inside. I had a Garmin GPS system in my hand. As I stopped at the lights, totally surrounded by traffic, 5 men ran up behind the car on the drivers side. The window of the vehicle was slightly open, just enough for one of the men to grab the keys of the vehicle. In one breath I realised I was being hijacked. Within seconds, it went from stopping at the lights to a man trying to pull me out of the vehicle. My instinct was to fight. I had no time to think, it was pure impulse. I just knew I had to keep the keys of the vehicle. If he took the keys we would be in severe trouble. One of the men was so close to my face I could feel his breath on my ear as he whispered, “I’m going to shoot you”. They obviously saw the Garmin in my hand as I drove to the lights and mistook it as an expensive phone. There are 2 aspects that made the situation worse. I wasn’t alone. My mother was with me. I had a seat belt on. My movement was restricted. Years before this, in Cambodia, a man threatened me with an AK47, trying to intimidate me into giving him money. It was a public environment so I knew the possibility of him shooting a tourist in public was minimal. I refused to be intimidated by him so in that situation I walked towards him, spoke very loudly and pretended to phone the police with a phone that didn’t even have a SIM card in it. He and his friend left as soon as they realised the gun did not control me. A few hours later after I relaxed I couldn’t believe my natural response had been to walk towards him; rather than running away. A bit like a wild animal: you never turn your back on a pointed gun. However in this situation at the lights, I wasn’t alone and I COULDN’T SEE THE GUN. I was trying to keep my eyes on the keys, but I also needed to see if he truly had a gun and maintain awareness of each of the 5 men. My eyes were darting back and forth between my knee, which I was using to keep the keys in the ignition while one of the men had his hand on the keys, trying to pull them out of the ignition, and this other man whispering in my ear. It was seconds but felt like ages. It felt like I was in the eye of a hurricane. There was chaos around me, but my mind was crystal clear. I could clearly feel my heartbeat in my chest and breath slow down. I finally thought if he really had a gun he would have shot me by now. Suddenly the cars around me starting driving forward, (no one attempted to help us even though 3 lanes of traffic surrounded us). All 5 men suddenly stepped away from the vehicle as if nothing had happened. The lights had turned green BUT I HAD STALLED THE VEHICLE. I couldn’t get away. At this moment I totally freaked out. I was shaking uncontrollably and had to stop the vehicle for a few minutes since my feet were shaking so much I couldn’t change the gears in a manual car. Surrounded by 5 men, who managed to open the electric windows and unlock all the doors. All they simply had to do was open one of the doors. “If you didn’t believe in Angels before this, you better now. I didn’t do that alone. We had help. My adrenaline and stress hormone, cortisol, had been pushed so far out of normal I had no idea how this would impact me in the months to come; that however is another blog post altogether. Given that I had instinctively walked towards the gun in Cambodia, I’m not sure what I would have done had I been alone in this situation, but in this instance, I knew I was fighting for my mom, more than for myself. Fast forward to yesterday, I am now in Canada. Doing 1 thing each year that terrifies me was the decision to shoot a gun. I have been anti-gun ownership for years. Even more so after this incident. However having an opinion on something, without personal experience of it is however a bit like blind faith. Question Everything is the philosophy of martial arts. So I decided it’s time to have a personal experience of a very strong opinion. How else will you learn about yourself? 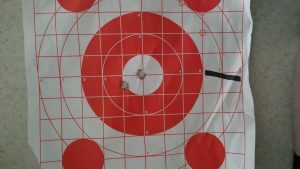 I found a shooting range, and signed up for a tactical package. I stopped the car at the shooting area, and got out the car just as someone was shooting an AR15. It felt like my ears exploded. I burst out laughing and thought “Oh my god woman”, what are you doing here?? I felt my mind racing. Interestingly enough there was a man standing there observing. My instinct was the need to touch. This laughing woman attached to his arm i.e me. No surprise I was at the wrong station. He gave me directions to where I was supposed to go and off I went. 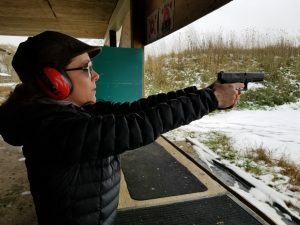 I am aware that my body was already full of adrenaline and cortisol before I even arrived at the range since it was snowing and I had to drive through snow and muddy farm roads with potholes to arrive at the range, which in itself was a new experience. First I was really scared. Totally intimidated! 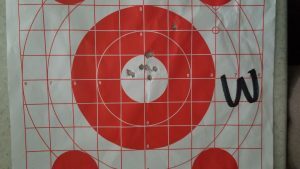 I asked the instructor to shoot 1 round first, so I could see what to expect. 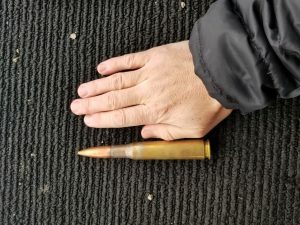 The 9mm gives a kickback but nothing too extreme. The first round was intense but as I focused on my progress of getting better, my mind got quieter and quieter. 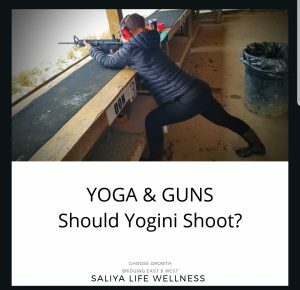 My yoga practice naturally kicked in without thinking, as I tuned into my breath and timed the shot with the second exhale. I was fully present in my body. Strong legs, active core muscles, exhale…fire. With each shot, my focus got better. 2. After the 9mm, next was the AR15. Again, initial stress response: afraid, intimidated. Is it going to hurt me? The instructor, Erik, was SO GREAT. The first shot blew my breath away. Stress response…..Laughter, disbelief, then amazement and curiosity. The yogic text, The Mahabharata, speaks of Arjuna going into battle but being able to fight with NO ANGER. PURE CLARITY. I can understand this now. 20 rounds later, mostly bulls eyes, I’m impressed with the capacity for focus. I was so focused many of the shots went through the same hole. This thing is a CANNON! BUT..this time the instructor didn’t fire one before me. I just had to do it without any knowledge of reasonable expectation. The only thing I knew was to keep my face 4 fingers from the sniper view otherwise it would hit me in the face, so now I WAS SCARED. This thing could seriously hurt me. After this, disbelief showed up immediately. WHAT? Only 1 round? There’s only 1 bullet in my package for this gun? Please can I shoot it again. So I did, and BULLS EYE AGAIN! I left full of self-confidence. No more fear of these things. Healthy respect, absolutely. Fear? No. Guns are not scary. People are. The ultimate outcome of everyone’s life is death. Death is inevitable. What’s more important is how you live. The ultimate conclusion and final emotion I was left with as I drove away was absolute gratefulness to Erik for sharing this experience with me. We had so much fun! I was left feeling confident in my ability knowing that I could never have experienced this alone. Life is indeed a team sport. My opinion on gun ownership has shifted. Will I shoot again? Yes! Will I get my gun license? Highly likely. Will I ever own a gun in my home?…..eeehhhh unlikely. Will I ever shoot a living creature? Absolutely not. Clay moving targets yes! Can’t wait to do that and also shoot a pumpkin!! There are many of those in North America. Perhaps what I understand more so now than ever before is how people find peace in violence. I could never understand how military can be so focused. I do now. 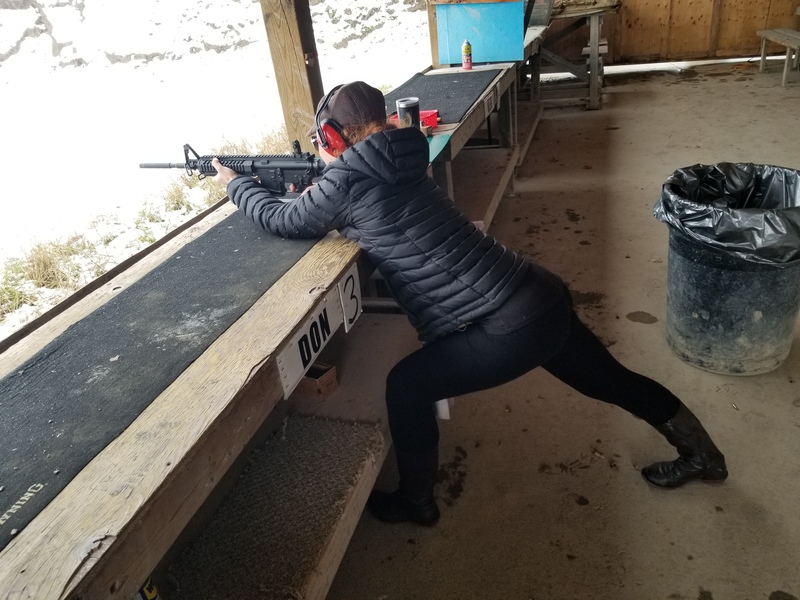 Yesterday with a fully loaded AR15 I found myself with absolute clarity of mind. Knowing when you’re in the stress response loop and more importantly, knowing how to get out of it. Should the general public have access to automatic rifles for personal home use? Without the knowlegde, training and full understanding of one-self, the natural stress response of humanity sets the stage for immense damage to be inflicted on harmless people. As much as economic theories would like us to believe that humans are rational beings, we are not. Emotional creatures armed with automatic weapons is a recipe for public disaster. With the handgun 9mm, it is not possible to fire multiple rounds quickly. The trigger is difficult to pull. This in itself removes the potential for large scale harm. An automatic rifle in the hands of someone caught in an unpredictable stress response has the potential for mass shootings. 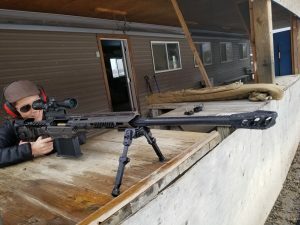 While I personally loved shooting this weapon, it has no place in general society outside of a strictly controlled environment. ie a military base and licensed shooting range. Have a laugh. It’s good for you. While life and the work I do is serious, having the ability to laugh at yourself is equally as important.